The human-headed bird represents the ba-soul, part of the Egyptian soul that could leave the tomb and travel both in this world and in the afterlife. The ancient Egyptians recited spells to ensure that the ba returned to the mummy, its natural home, from its various journeys. This mummy cover represents the extreme of wealth in Roman Egypt. 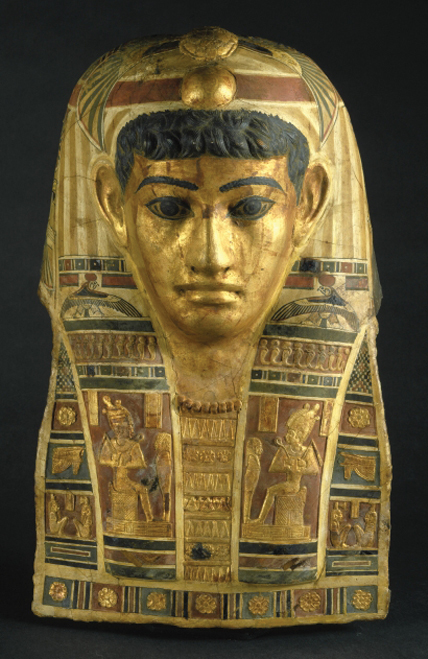 The professionally crafted, gilded, and inlaid mummy cartonnage represents a woman whose life and death were spent in luxury. When the Romans ruled Egypt (30 B.C.E.–642 C.E. ), some wealthy Greeks there were mummified. 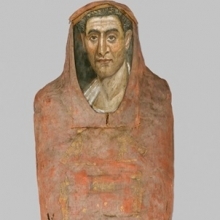 This mummy was made with expensive imported materials that show the wealth Demetrios commanded in life. It is wrapped in a linen shroud painted with red pigment made with lead imported from Spain. 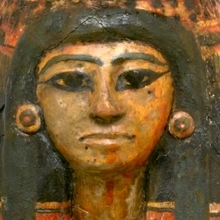 The mummy includes a Roman-style portrait of Demetrios painted on a wooden panel in the medium of encaustic, or wax plus pigment. Artists added Egyptian divine symbols to the mummy shroud and the deceased’s name and age at death, recorded as fifty-nine years, all in gold leaf. A recent CT scan (or three-dimensional X-ray) of this mummy reveals that the individual suffered from gallstones during his life. 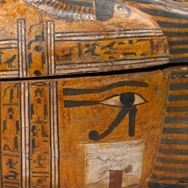 In this coffin set, Weretwahset combined the lid with the usually separate piece called the mummy board. 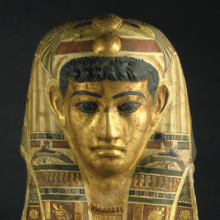 A coffin lid is generally decorated to present the deceased as Osiris. Here, instead, the deceased wears a dress she would have worn in life—an image that more often formed the decoration for the mummy board, which would have rested inside the coffin and on top of the mummy. Bensuipet erased Weretwahset’s name from the side of the coffin and added her own, about two hundred years after Weretwahset died. Bensuipet also added the mask and body cover, perhaps from another coffin set. All Egyptians after the New Kingdom desired a coffin representing them as Osiris. Although the coffin stands for the box that Seth used to trap Osiris, in the tomb the coffin protects the person who will become Osiris. 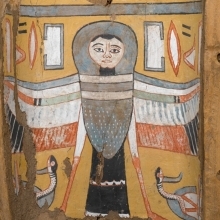 This coffin was made for Teti, a “Servant of the Great Place.” This title was used by artisans who painted tombs in the Valley of the Kings and lived in Deir el-Medina. As a middle-class artisan, he paid nearly a year’s salary for a coffin of this quality. He was able to use five different paint colors to decorate his wooden coffin, including blue, yellow, red, black, and white. He paid separately for each paint color. The yellow background paint with red streaks is used to imitate the gilded coffins of the wealthy. Encompassing more than one hundred objects drawn from the Brooklyn Museum’s world-renowned holdings of ancient Egyptian art, including some of the greatest masterworks of the Egyptian artistic heritage, To Live Forever explores the Egyptians’ beliefs about life, death, and the afterlife; the process of mummification; the conduct of a funeral; and the different types of tombs—answering questions at the core of the public’s fascination with ancient Egypt. Two of the primary cultural tenets through thousands of years of ancient Egyptian civilization were a belief in the afterlife and the view that death was an enemy that could be vanquished. To Live Forever features objects that illustrate a range of strategies the ancient Egyptians developed to defeat death, including mummification and various rituals performed in the tomb. 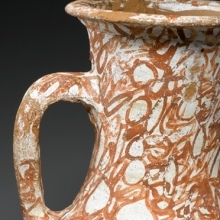 The exhibition reveals what the Egyptians believed they would find in the next world and contrasts how the rich and the poor prepared for the hereafter. The economics of the funeral are examined, including how the poor tried to imitate the costly appearance of the grave goods of the rich in order to ensure a better place in the afterlife. Each section of the exhibition contains funeral equipment for the rich, the middle class, and the poor. The visitor will be able to compare finely painted wood and stone coffins made for the rich with the clay coffins the poor made for themselves; masterfully worked granite vessels with clay vessels painted in imitation; and gold jewelry created for the nobles with faience amulets fashioned from a man-made turquoise substitute. 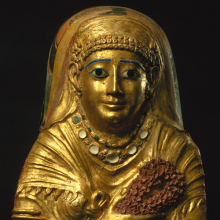 Objects on view include Female Figurine—one of the oldest preserved statues from all Egyptian history and a signature Brooklyn Museum object; a painted limestone relief of Queen Neferu; a gilded, glass, and faience mummy cartonnage of a woman; the elaborately painted shroud of Neferhotep; a gilded mummy mask of a man; and a gold amulet representing the human soul. To Live Forever: Art and the Afterlife in Ancient Egypt is organized by Edward Bleiberg, Curator of Egyptian Art at the Brooklyn Museum. The exhibition is supported by the Brooklyn Museum’s Charles Edwin Wilbour Fund. Additional generous support is provided by The William Kelly Simpson Foundation, Fred and Diana Elghanayan, and Magda Saleh and Jack Josephson.